Even though Spring Festival, as Chinese New Year is called in China, is the nation’s most important holiday, there is no entry for it in my diary. Holidays were not popular with the leaders of the Cultural Revolution, and Zhou Enlai’s recent death also called for a low profile Spring Festival. This did not bother us, as we had more important things on our minds.
. . . we would go on a trip. Spring Festival marked the beginning of the Winter Holiday (hanjia in Chinese, literally: ‘cold holiday’). Lectures would stop for two weeks, and the Beijing Language Institute would organize a trip to Nanjing, Hangzhou, and Shanghai, the three main cities in the Yangtze River Delta. We were eagerly awaiting leaving Beijing for a while. We obviously had not seen every corner of the city yet, but life was getting a little monotonous, especially for young restless Westerners. We were dying for a change of scenery. Traveling on your own was allowed, but in those days foreigners needed to apply for a travel permit. You were required to book your entire trip with China International Travel Service (CITS), one of those convenient monopolist institutions. As it was the only travel agency available, there was no need to thank you for your patronage; you had no choice to begin with. The upside was that you need not waste time on comparing special offers from various travel agencies. . .
. . . We accepted the school’s offer to do all this connecting on our behalf. By now you will realize that the Beijing Language Institute was a school with a certain reputation in China. People like Teacher Bi would not be assigned to take care of the foreign students, if the government would not have the intention to ensure that we were having the time of our life in the Institute. . .
. . . Such an institution did not use CITS as its agent but went through the Ministry of Education. 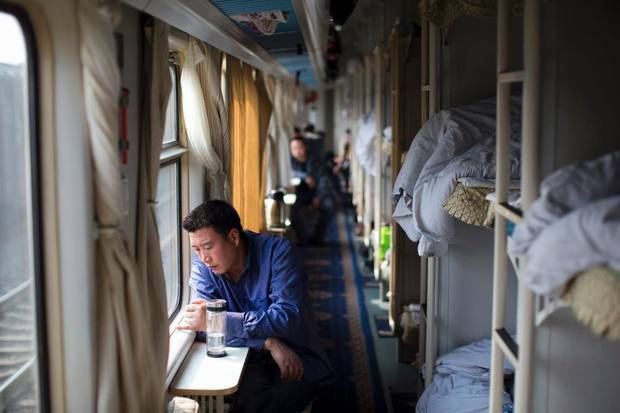 While CITS could book seats or berths in a train, if needed, the Ministry could order the railroad corporation to add an entire carriage for a party of students and teachers of the Beijing Language Institute. Moreover, the Ministry would use their local offices in provinces and cities outside Beijing to take care of the local visits to sites, factories, people’s communes, cinemas, the lot. They could assign students of English to act as guides, for whom it would be an occasion to practice their spoken English with real foreigners, although we all spoke Chinese, some better than others. . .
We packed some clothes and other stuff we guessed would be useful during the trip and gathered near the infamous Slogan Tower to board the school buses, as we had gotten used to.
. . . We set off late in the evening of February 4, 1976. I specifically entered the departure time, 23:00 hrs., which was unusually detailed for my standards. Apparently, it struck me as odd to get in a couple of buses so late and drive to the Beijing Station. After a few of those trips, you start to understand why. Your train ticket buys you a berth (in our case) or a seat in the train. This can save you a night in a hotel. . .
For most of us, it was our first trip in China and everything was new, so it was an excellent occasion to observe how the Chinese behaved in this environment.
. . . 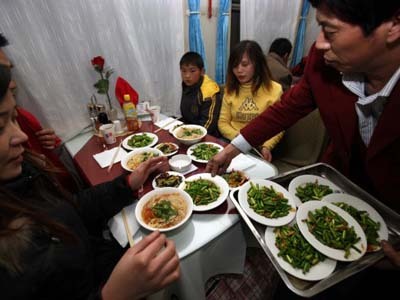 The Chinese passengers struck us as if they had skipped dinner that evening, to make sure that they would have a serious appetite when boarding the train. All that eating was bound to create waste: sausage skins, eggshells, watermelon seeds, and skins, chicken bones. To our unpleasant surprise much of that ended up on the floor. Suddenly, the long awaited trip of our life did not seem so pretty anymore. If our fellow passengers would continue incinerating their victuals at that speed, we feared that we would soon be standing in a knee-high pile of greasy smelly trash. However, the train attendants were there to come to our rescue again. After a round with the thermos flasks, they soon returned with their brooms, to sweep the leftovers of their hungry guests to a waste bin at the end of each wagon. We were amazed. We definitely did not feel confident enough to do as the Romans do and collected our garbage in bags and boxes. The Chinese passengers were probably equally amazed about our behavior. . .
. . . Interestingly, treating train attendants as slaves was not a matter of class differences. In those days, someone who as able to buy a train ticket from Beijing to, e.g., Shanghai had to be politically kosher, a representative of the masses of workers, peasants, and soldiers. However, these politically kosher people would not automatically treat the train attendants as their equals. Maybe many train attendants were rightists or offspring of rightists who needed to be taught a lesson in humility. The apex of all this came at the end of our journey, when the Head of attendants took the microphone to ‘thank the travelers for their cooperation’. That was a mind-boggling statement. . .
As we departed around midnight, sleeping was our next problem.
. . . There are four classes in Chinese trains. Classes? Yes, while the Chinese revolution, and particularly the cultural one, aimed to achieve a classless society, the classes in trains have never been abolished. The absolute top was the so called ‘soft sleeper’. These were compartments with four berths and doors that could be closed to give the occupants some privacy and a little less noise. Then came the ‘soft seats’. These were more comfortable that the hard seats, but arranged in a standard compartment. These were used by VIP travelers who only needed to travel in day time, although some would also sleep in those chairs to cut some costs. The third level was the ‘hard sleeper’. There you had to share a compartment with five others and there was no door to shut off the noise of your fellow travelers. Finally there were the ‘hard seats’, the cheapest and toughest way of traveling by train in China. Still, many of my acquaintances have travelled for days in a hard seat carriage. It helps to travel in a group, so the social interaction can distract you somewhat from the physical discomfort. . .
We were put up in a hard sleeper compartment. I assume that this had not only been decided on the basis of our societal position in China, but also to avoid contacts between us and the VIPs that would travel in soft sleepers.
. . . In those days, most soft sleeper travelers were highly positioned officials. They were not eagerly awaiting sharing their privileged compartments with ordinary people who might have saved a few pennies each month for a couple of years to finance a journey back to their native region in a more comfortable way. . .
. . . High ranking officials would meet people of similar rank from various organizations during such travels. These were valuable occasions for social interaction between peers who otherwise would not have many opportunities to get acquainted in a society in which the emergence of informal groups was highly discouraged. Four company leaders meeting in a restaurant may draw attention, but when they happened to be on the same train . . . Such a long distance train in China therefore was a cross section of the entire Chinese society. For us foreign students it was an excellent occasion to observe Chinese of different ranks interacting within their own ranks as well as between different ranks. We were observing and discussing what we observed. Undoubtedly, we were the topic of such observing and discussing by our Chinese fellow travelers as well. . .
. . . A hard sleeper carriage was divided in several open compartments, with six berths in each compartment; three on each side. 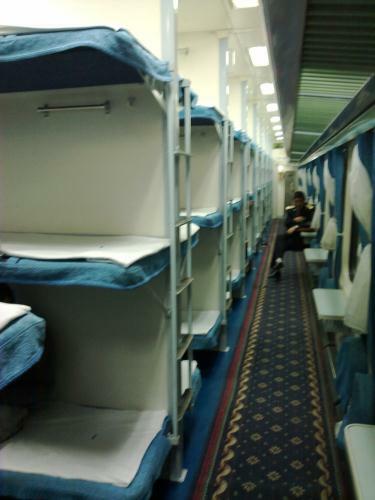 The middle berths were folded up against the wall during daytime, so passengers could sit on the lower berths. This created a variety of pros and cons for each level. If you were assigned a top berth, you had the freedom to lie down whenever you wanted, e.g., to do some quiet reading. A disadvantage was that you were very close to the ceiling and many of us bumped our heads numerous times during the trip. The people on the mid-level berth did not have that option, until 10:00 pm, when their berths would be folded down, but you had a few centimeters more space. A downside was that the feet of most Western students were sticking out of the compartment when lying straight. This meant that people walking in the corridor would constantly bump their heads against your feet. To avoid that, you needed to sleep in a fetus position. The passengers on the lower berths had to share theirs with the other four occupants of the compartment during daytime, although you could lie down for a while, pressing yourself against the wall, which left just enough space for the bottoms of your fellow passengers. The downside was that those bottoms were there for you to look at. The big pro of a lower berth was that you could visit the toilet at night without the need to climb down and up again. . .
During such a long haul train ride, meals became our favorite pastime.
. . . We had three peak events to look forward to on long Chinese train rides: breakfast, lunch, and dinner. This was not because they were such a culinary tour de force. Neither was it because we were hungry, as we had few opportunities to burn calories. Still, few of us skipped a meal, simply because meals were served in the diner, so we finally had an occasion to walk and get some exercise. And you could sit on a chair, instead of a berth, or one of the small fold out chairs in the corridors. We would still eat separately, after the Chinese passengers had eaten their meal. The Chinese passengers must have been as bored as we with the monotony of the train ride. Even after spending so much time snacking, most of them still went to the diner three times a day. The train cooks tried to concoct a Western breakfast for us, with white bread and fried eggs. It was not too bad, but dangerously fattening. As a Dutchman I prefer brown bread and cheese for breakfast, and try to stay away from the eggs, bacon and sausages that the British love for breakfast. Lunch and dinner consisted of a bowl of lukewarm rice per person and a few greasy dishes per table. . .
We soon made a discovery that would make life on the Chinese train a lot more bearable.
. . . The first lunch on the train revealed an important piece of information: you could buy beer in the diner, not only for consumption during meals taken there, but also to take back to your own carriage. This added spice to our boring life on the train. After dinner, we would bring a few bottles of beer back ‘home’, just enough to make us a little drowsy to forget the boredom and help us fall asleep. . . Such help was welcome, as sleeping in a Chinese train throughout the night was a genuine challenge. People kept walking around, and you would be cruelly woken up, whenever the train stopped at a station. Some passengers got off, while new ones alighted; several times that night. We were happy to reach Nanjing in the morning of the following day. This entry was posted in Uncategorized and tagged Chines train, hanjia, hard sleeper, Spring Festival by eurasiaconsult. Bookmark the permalink.